'Nine Quarter City' is a design studio project conducted by first year students in the Bachelor of Design in Architecture at the University of Sydney. The project advances the themes of assemblage and transformation that were introduced in first semester, but with greater emphasis on the generation of a single architectural proposal in a complex urban context. It commences at an urban scale. 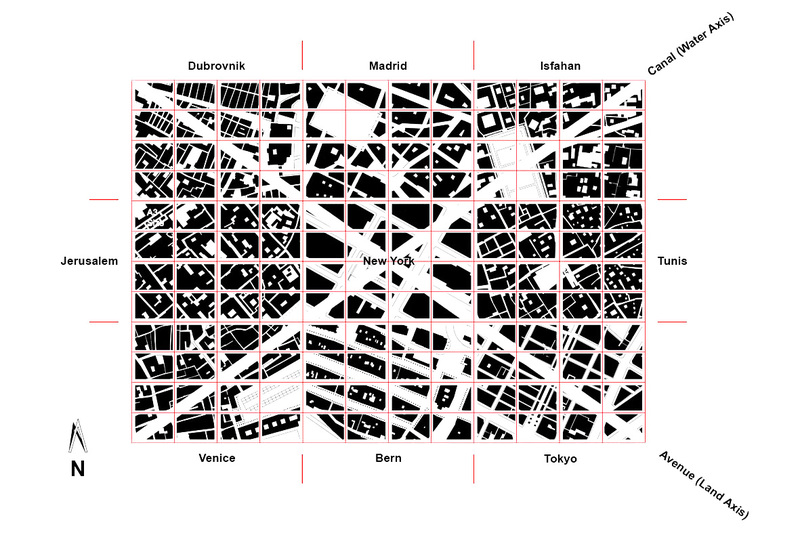 A 'generic city' of strict geometry has been fused with 9 actual cities (Dubrovnik, Madrid, Isfahan, Tunis, Tokyo, Bern, Venice, Jerusalem and New York) to create 9 distinct 'quarters' which are nevertheless woven into an overall urban order that is stabilized by two major diagonal axes, one water and one land. Each studio group of 16 students is allocated a different 'quarter' of the city comprising 16 adjacent blocks. A figure-ground plan (built form represented as black, and open space as white) has been created and serves as the basis for the initial tasks undertaken as a 'conversation' with the other members of the group. Students are charged with elaborating on the basic plan, deciding on a range of buildings that their quarter of the city needs, then deciding on a specific program for their allocated city block and developing a concrete architectural proposal for one building on this block. The work is seen as a series of transformations based on an understanding that all architecture (including one's own) is constituted by other architecture, which one appropriates, reconfigures, transforms, and makes one's own. The project is conducted as a series of related exercises with an emphasis on practical experimentation. The work is drawn together into a final presentation, comprising a well-crafted model and one A1 sheet of drawings of an exhibition standard.